I came across the Minecraft Toy Iron Golem while I was searching for more Minecraft figures to collect. Because these toys have all been of great quality so far, I wanted some more. I love collecting toys from Minecraft because the game is full of such memorable characters. The gentle giant known as the Iron Golem is one such fellow. 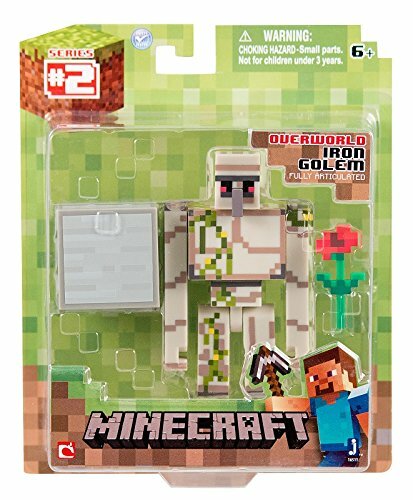 It doesn’t hurt that these toys are in such high demand right now due to how popular Minecraft is with kids and adults. This toy wasn’t just a cheap cash in. It’s well-made and looks fantastic. What does the Iron Golem Toy look like? If you’re not familiar with Minecraft I’m sure this character looks very strange to you. He has a big Squidward nose, eyes that go in different directions, short legs, and long arms. But, I can assure you that if you spend some time in a village, you’ll think of him as less of a strange creature and more of a friend. His odd proportions are actually part of his charm. He stands out as a character and the loud footsteps he makes are more comforting when you know he will defend you from evil. Just like from the game. A tall golem made of iron. He has some vines running down his side and arm to reinforce the fact that he’s an ancient guardian. And that’s what he does in the game too. He protects villages from zombie invasions and other evil doers. The action figure’s color palette is cleaned up a little bit and it’s more simple. I personally prefer the more simplified look of this iron golem to the one in the game. Although, they do look very similar. He has a cute and simple look with bright colors. It’s simple pixel art for a nice clean crisp aesthetic. I love that you can place the flower in his hands to make him seem more like a kind soul and a protector. It shows off his gentle nature. It’s very cute. The box for the Iron Golem is very nice. It’s a lighter shade of green than the boxes for the series one characters. And that’s because the Iron Golem is a series 2 character. Also included in the series 2 figures are the Villager, the Spider Jockey, and Diamond Armor Steve. Again the box features the look of a grass block and shows the figure through the plastic with a cardboard back. The Minecraft logo is also displayed with Steve. You can also clearly see that this figure comes with the Iron block and flower accessories. An /span> This toy does not deviate from that expectation. The accessories that come with the toy iron golem from Minecraft are the red flower and the iron block. The iron golem can actually create red flowers that he then gives out to villagers. I suppose it’s a sign of friendship. And the iron golem is made of, well, iron so it only makes sense that he comes with an iron block. You can actually make iron golems using iron blocks and a pumpkin head. If you loved the Iron Golem, you’ll want to take a look at some more of the enemy mobs from Minecraft. Two of my favorites are the Minecraft Creeper and The Minecraft Zombie. They are both equally as awesome as the Iron Golem and I love them.